Host a grand reception or an intimate meeting in our stunning venues at Holiday Inn & Suites North Vancouver. 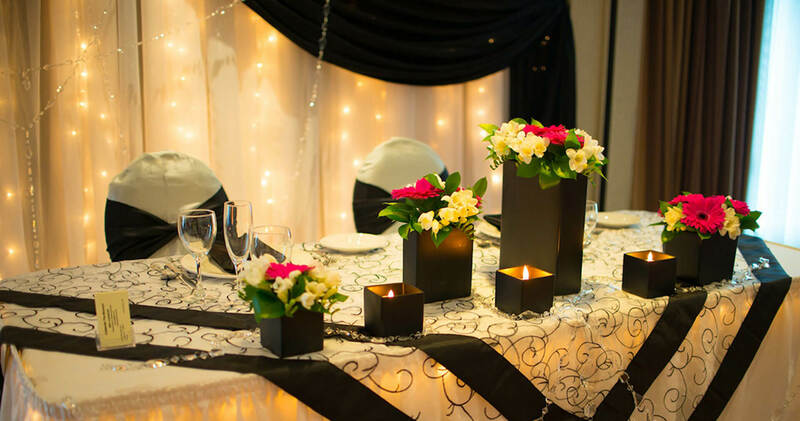 Totalling approximately 1820 square feet of elegant event space, our hotel offers professional event planning and catering services for functions of all sizes. Aptly named after the area’s most popular natural attractions, the Seymour Room, Grouse Room and Capilano Room may be combined to create the expansive North Shore Ballroom, perfect for large events and wedding receptions. All of our venue spaces have easy access to private washrooms reserved for event guests and a secure coat room. To book a venue at Holiday Inn & Suites North Vancouver, please fill out our online Request for Proposal or contact the hotel event staff directly by email or phone at 604-904-2728. Featuring floor-to-ceiling windows and plenty of natural light to fill this grand space, the North Shore Ballroom combines the Seymour Room, Grouse Room and Capilano Room to create an incredible venue for large banquets, wedding receptions and dinner-dance events. The Seymour Room (915 square feet) is our largest room, when separated from the adjoined spaces. Featuring two floor-to-ceiling windows, this space can host up to 100 people. Located between the Seymour Room and the Capilano Room, the Grouse Room (468 square feet) comfortably accommodates up to 45 people. Ideal for meetings and social functions, this room offers floor-to-ceiling windows and plenty of natural light. The Capliano Room (416 square feet) offers large, bright windows and can be combined with the Grouse Room and the Seymour Room for added space. This space is perfect for intimate business and social events, comfortably accommodating up to 45 people. A stand-alone room located across the hall from the main North Shore Ballroom, the Lillooet Room (384 square feet) is ideal for boardroom meetings or a break-out room for larger events happening in the main Ballroom. This room comfortably accommodates up to 30 people. * Seating arrangements for each room depends on space allocations for the head table, dance floor, staging, audio-visual set-ups and hors d’oeuvres layout. HOLIDAY INN & SUITES NORTH VANCOUVER. ALL RIGHTS RESERVED.